Jean Dubuffet was part of the post-WWII European avant-garde, his work representing a radical questioning of the aesthetic principals of western culture, in a response to the loss of horizons in the aftermath of the Second World War. The focus of Dubuffet’s field of experimentation was graphics free of all rules, and the vindication of matter as an element of communication. During this period, he did a series of compositions based on compact painting matter mixed with sand, ash and tar, into which he made incisions. In Dialogue aux oiseaux (Dialogue Between Birds, 1949) form is eradicated in favour of matter, the image of the bird being suggested on the extreme edge of the canvas. The work opposes the dominance of perspective by an absolute absence of any spatial elements, and at the same time does away with the traditional concept of the picture as a window, because the resulting matter stands as a kind of wall onto which personal graphics are scrawled like graffiti, which build into scenes. 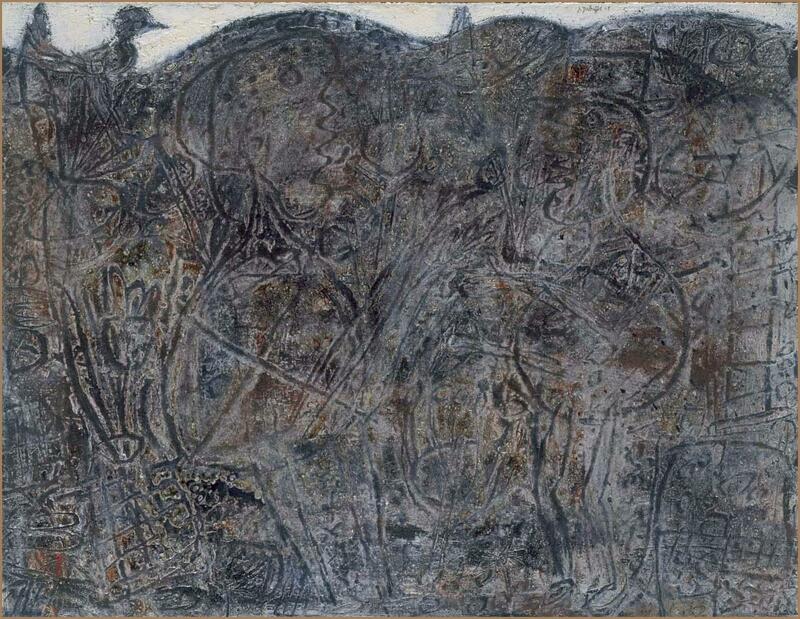 Dubuffet’s work was highly controversial at the time for the aesthetic ‘ugliness’ it applied to painting. His output, identified with what was called Art Brut, formed a matter-based approach to the gestures of rejection of transcendence that abounded at the time in other areas such as philosophy, poetry and the theatre. Jean Dubuffet : partitions 1980-81; psycho-sites 1981 / Jean Dubuffet. Dubuffet, Jean ( 1901-1985)New York : Pace Gallery, 1981.